/ How to clean a carburetor on a lawn mower without removing it? 1 What Makes A Carburator to Stop Working? 2 Can You Clean A Mower Carburetor Without Removing It? 3.1 What Tools Do You Need? How to clean a carburetor on a lawn mower without removing it is a common question if you are a lawn mower user. The carburetor is one of the key parts as long as the engine of a lawn mower is concerned. While this part is in a troublesome situation, the whole purpose of a lawn mower gets stuck. So, lawn mower users have to keep a sharp eye to maintain a clean and functioning carburetor. In case you’re interested in performing the task without removing the carburetor itself, this article is written for you. What Makes A Carburator to Stop Working? Carburators are likely to be affected by various blockages if you keep it idle for a long time. Even during regular use on the field, this trouble can happen to lawn mower carburetors. The types of dirt that take place within the carburetor are mainly dirt, gasoline deposits, oil deposits, varnishes, etc. Apart from these, there is a definite factor of lawn mower carburetor lifetime. 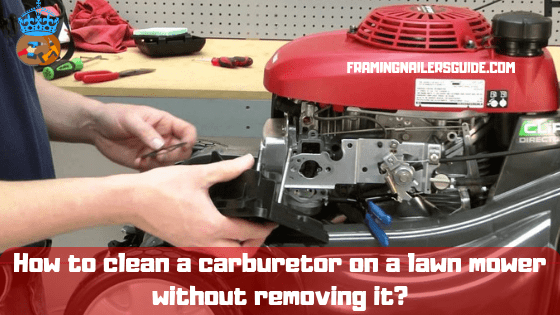 Can You Clean A Mower Carburetor Without Removing It? The one word answer to the question is- Yes, you can. But some conditions imply cleaning a lawn mower carburetor without removing it. If the carburetor is old enough not to produce a consistent service at a clean condition, you should rather remove and replace it with a new one. In case your carburetor is not old enough, except for some gunk and dirt buildup, you can go through the next steps. You need to have two kinds of tools in this case. One is the Aerosol spray cleaner for carburetors, and another is the lawn mower maintenance kit. The aerosol spray is going to be our cleaning agent. And the kit box will contain all the essential tools like screwdrivers to open and close the air filter, carburetor cover, carburetor linkage, etc. Once you have got both of these items in hand, let’s proceed to the next steps. First thing first, make sure that you are 100% certain about cleaning the carburetor up. We mean, if the mower engine stops working, the carburetor can be one of the suspects. Unless you make it 100% certain, your whole cleaning effort can go in vain. Take a short burst of aerosol lubricant and apply on the carburetor. You can also use any cleaner that is specified for using or carburetors. Now, try to start the mower properly. If it starts with no problem, then the source of the problem is something else than the carburetor. If it doesn’t start yet, move to the next step. At first, place, turn off the mower and let it cool down for a while. Once done, open up the cover of the air filter with the help of a screwdriver. This will expose the carburetor to you. Now, remove the carburetor exterior cover and the linkage as well. This will expose the insider parts of the carburetor itself. Keeping it in that condition, the carburetor will dry up within a short time. Wait until then, and start the engine now. As we’ve said before, you need to have a good quality carburetor cleaner aerosol spray. And this is the step where we are going to use it on the carburetor. Place the tip of the spray into the center of the carburetor, and spray it onto the carburetor. Make sure that your mower engine and the carburetor is running while you’re going through this step. Make sure that the spray penetrates throughout the whole carburetor throat. There will be oil and dirt deposit at the lower throttle plate of the carburetor. Remove that with care. Now, spray the aerosol on the choke shaft which is located at the base of the carburetor throat. Make sure that the engine is shut off while you’re applying this spray on the choke shaft. We are pretending in today’s concern that, we won’t remove or replace the carburetor itself. But for optimal performance, you need to replace the carburetor cover and the linkage. Right after replacing the old cover and linkage, put the air filter back on its place. Use a screw to tighten the air filter. If you are still reading this article, it means you know how to clean a carburetor on a lawn mower without removing it. But there are safety tips that you might keep in mind. First one is when the engine is on, and the carburetor is in action; don’t touch the carburetor at all, not even with gloves. And the second advice is, don’t start working on the carburetor open-up until it’s freezing. That being said, you’re also advised to use the right tools to open the air filter and carburetor cover. Making sure that the connections are tight is one of the safety concerns that you need to follow.